Leonard Bernstein was unquestionably one of the most original, versatile and inspiring figures of twentieth-century music across all genres � a composer, conductor, pianist and educator who brought passion and vitality to everything he did. 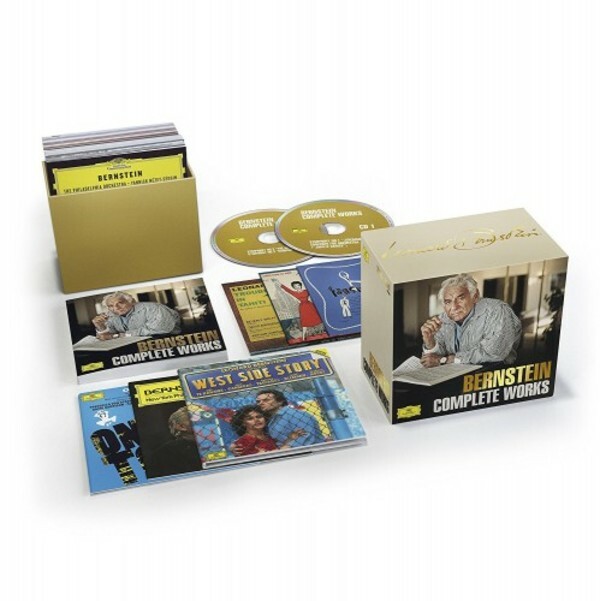 In this, Bernstein�s centenary year, Deutsche Grammophon honors his legacy as a composer by releasing � for the very first time! � his Complete Works. Curated in close collaboration with the Bernstein estate, this limited-edition set brings together his complete published works. Encompassing everything from West Side Story, Candide and Mass to choral works such as the Chichester Psalms, chamber pieces and music for solo piano, Bernstein�s Complete Works reveals the astonishing range of styles mastered by this exceptional musician. A unique anthology, it stands as the jewel in the crown of our Bernstein centenary celebration. Leonard Bernstein�s complete published works collected together for the first time, including his music for ballet, opera and musicals, his incidental music, scores for film, orchestra and chamber ensembles, vocal scores and piano music.